Although you can monitor and troubleshoot SQL Server performance by using native tools, there are limitations and shortcomings that make the process time consuming and labor intensive. 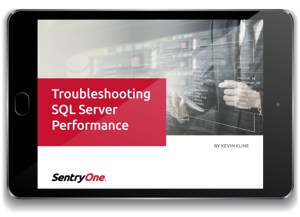 In this four-part guide, Kevin Kline, Principal Program Manager at SentryOne, walks you through the process of identifying and resolving SQL Server performance problems by using SQL Server’s native tools. Part 2: Inside or Outside SQL Server? Error or not? Part 3: Where are the Waits? Find out how to easily monitor, diagnose, and optimize your SQL Server performance using SentryOne’s SQL Sentry database performance management platform.